November 30 – December 1, 2, 3 & 4, 1971. AL wrote “The penal settlement in Cayeene in French Guiana was notorious throughout the world. Its convicts lived like animals and died in hundreds from harsh treatment or disease. Escape was frequent, but rarely successful. The jungle and the sea were implacable jailers. This is the setting for the play My Three Angels, but what a different story unfolds. In this intriguing comedy, adapted by Sam and Bella Spewack from Cuisines des Anges by Albert Husson, there are all the ingredients of a fairy tale – not one, but three ‘Fairy Godmothers’ outwitting and finally overcoming the ‘Demon King’. Whilst he does not vanish in the usual puff of smoke he is neatly disposed of and relief abounds for all who have been subjected to his villainous ways – good triumphs over evil yet again! Our formative years, 1050 to 1955, gave members a valuable experience in a wide variety of plays of the lighter type culminating in December 1955 with our president Mrs. Penney’s own play A Christmas Story, in which many local clergy and church members took part. This was the first of three presentations of this play, the last being in 1965 when it was dressed in the Byzantine style. 1956 saw an advance into the field of more demanding drama, even classics, where experience in acting and production began to pay off. Mush of this was due to the skills of members willing to tackle the difficult parts demanded by Pygmalion  The Importance of Being Ernest  Captain Carvallo and The Heiress  and Don’t Listen Ladies . The settings from this time onwards began to show considerable improvement and we have John Perrett to thank for the standard created with that delightful cottage in Captain Carvallo. Though we have so far only mentioned our early ventures into the classics where Pat Johnson and Jean Porter made their mark with us, it should not be assumed that we neglected the lighter side. Ian and Betty Elliott, Ralph and Betty Dawes, Brian and Frances Moulton, all excelled in modern entertainment like – The Happiest Days of your Life , Life with Father  Sailor Beware and Sleeping Partner  all of which had great box office appeal. Two very talented youngsters, whilst still at school made their debut in 1957 – Clodagh O’Farrell and Ray Hopper in The Happiest Days of Your Life – and their impact on the Company later on was very strong as many of you will know. Another tall young man arrived with us in 1958 – Barrie Bowen – but more of that later and what happened to him in Sailor Beware. Douglas Tucker who plays Felix in tonight’s play is a bank manager by profession. He has given Wick the benefit of his wide experience in organisation and fund raising over the past two years and has also found time to turn in memorable performances as Folliot in Becket and Colt in Hotel Paradiso. 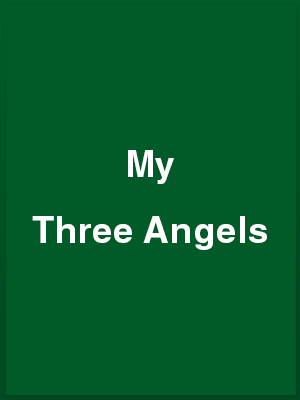 If the Wick Theatre Company production of My Three Angels, which runs at the Barn Theatre tonight [Friday] and tomorrow, is not the best comedy the company has produced I am extremely happy for them. The play itself, adapted by Bella and Sam Spewack from the Cuisine des Anges, by Albert Husson, is well constructed and the Wick waste no opportunity for a laugh, although no one [metaphorically speaking] is dropping their trousers for a laugh. All the ace cards are dealt to the three convicts, who are the ‘angels’ of the title. They are more sympathetic, honest and wiser that the crowd of conventionally honest buffoons whose lives they save from individual disaster over the course of one Christmas. Jack Bingham, Ralph Dawes and John Davidson manage to produce some very funny situations. Although the show is in some respects stolen by Jack Bingham’s performance as Joseph , which at times seems less like inspire casting than an exercise in free expression, it is the excellence of small detail which really makes this production stand out. To begin with the group have made full use of their new workshop to produce a quality set for the players to work on. The action is set in a wooden hut in French Guiana, and the real timber, rather than the painted canvas, has been used to give a really realistic effect, and full marks should go to George Laye and his team who built it. But even those in the smaller parts produce some delightful little character studies. Barrie Bowen will make few friends with his villainous performance as Gaston Lemare, which would have been guaranteed to have the whole audience hissing in the days of the old musical hall. Nor could one but notice Valerie Bingham as the conniving, but transparently dishonest Madame Dulay. Douglas Tucker, as the hopelessly ineffectual shopkeeper, Felix Dulay, who wears his frock coat in temperatures of 105 deg. F. because ‘I have a position to maintain’, and Betty Dawes as his down to earth wife, also turn in good performances. Taking her first major part in a Wick production, Ann Baker, formerly of the Ham Players, Shoreham, produced a well rounded Marie Louise Dulay, the lovelorn daughter. Her slightly gawky manner and diction fitted her part to a tee and she is likely to be quite an asset to the group. This is a very good version of an excellent play and should repay anyone the effort of a visit to the Barn tonight or tomorrow. Do go along to the Barn Theatre, Southwick, this week and have an evening of quite delightful fun with My Three Angels. This is an extremely witty play to start with and the Wick Theatre Company’s presentation does not lose any of it. The timing of lines, the most difficult of comedy, is almost perfect and particularly is this true of Jack Bingham as Angel No. 3011. But this slight emphasis on Jack’s performance must not be thought to detract from those of Ralph Dawes as 6817 and John Davidson as 4707. The three angels are, of course, convicts from the French penal settlement at Cayenne in French Guiana in the year 1910. The family for whom they are working and by whom they are invited for Christmas consists of Felix and Emily Dulay who run a general store most inefficiently. They are played by Douglas Tucker and Betty Dawes with great conviction. Their daughter Marie-Louise [played by Ann Baker] is in, love with Paul Gassogon [Neil Shepard]. This Paul is a real character, totally dominated by his uncle, Gaston Lemare, who actually owns the store and who arrives to go through the books, a proceeding which spells disaster for the woolly-headed Felix. Barrie Bowen as Gaston is completely the ruthless martinet whose mantle falls on Paul after … but that would be to give too much away. The way in which the three very amiable convicts solve the problems of the Dulay family is the very stuff of comedy. Valerie Burt is Madame Parole who does not pay her account, and Susan Hollis and David Wiltshire appear briefly as a native girl and Sub.-Lt. Espoir. I am sorry the programme does not mention the set designer, as the stage setting is one of the best and most workmanlike that I have seen in my many years of reviewing amateur drama. Production was by Audrey Laye with George Laye as stage director.